The idea that money tokens have a time value is deeply embedded in economic thinking and analysis. It has arisen because most money tokens are created with interest immediately payable. It is an idea that should be abandoned. When new money tokens are created the tokens should be interest-free. Money tokens become interest bearing after they are exchanged for assets of value. The time value of money is the value of money figuring in a given amount of interest earned or inflation accrued over a given amount of time. The ultimate principle suggests that a certain amount of money today has different buying power than the same amount of money in the future. This notion exists both because there is an opportunity to earn interest on the money and because inflation will drive prices up, thus changing the “value” of the money. The time value of money is the central concept in finance theory. In our current economic systems money, tokens are deemed to have a value over time because they are created with an interest value attached. As a result, central banks are forced to encourage inflation of the currency to compensate for putting an interest value on money tokens before the tokens are used. The time value of money has arisen because money represents assets and assets have a value over time because they can generate income over time. It is the confusion between the properties of what money represents and money tokens themselves that has created the problem. Money does not have a value over time until it represents an asset. Hence interest on money reflects the world of commerce only if the money represents a real asset. What this means is that money, when it has been saved, can have interest attached. Money, when it represents a given asset, can have interest attached if the asset is used to generate income or if the asset increases in value over time. Until that time money should not have an interest attached. For our accounting systems to better reflect the economic reality we need to change our accounting practices to remove the time value of money on newly created money tokens. We can do this within the existing framework of commerce, and we can do it incrementally with minor changes to current accounting and taxation practises. New money tokens are created when an asset is monetized. The asset may be a physical asset such as a house, or the asset may be the ability of an entity to repay. This happens when a government creates money tokens or a bank issues a loan. When money tokens are introduced into the system this way, then there is no systematic problem with putting interest onto the money tokens because the tokens represent an asset that can repay the loan and pay the interest. However, new money tokens are also introduced into the system when interest is paid on unpaid interest or when new tokens are introduced into the system when a loan is backed by another loan. In these cases, there are no productive assets to the pay the interest. This debt (new money tokens) created from interest on interest or loans on loans is the root of the current debt problem. 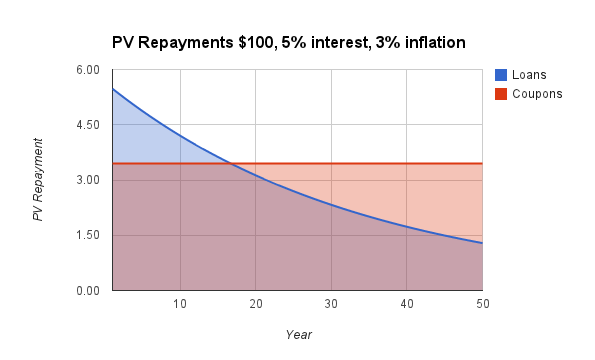 Interest on interest can be eliminated by a simple change to the way we account for the repayment of debt. Governments can reduce the need for loans on loans by ensuring there are enough money tokens in the system to support economic activity. When a debt is repaid, the current accounting approach is to pay any interest owing first and if there are any funds remaining to repay the capital. The accounting can be changed to pay capital first then pay interest when all the capital is repaid. The interest that has not yet been repaid does not represent a productive asset, so it does not attract interest. However, investors will not invest or save money without interest on interest because of endemic inflation. Inflation reduces the value of money, and because of inflation money, tokens need to have a time value. Another way to eliminate this time value of money is to increase all loans and all unpaid interest with inflation. It is difficult to change the existing money system to incorporate these new accounting practices. However, it is possible to modify the system incrementally with individual loans and to use special purpose money for these loans. This special purpose money shall be called Rewards because Investors get a Discount Reward. The money can be used to build or purchase an asset that will produce a profit that can be used to both repay the investor and to pay interest on the Rewards. To keep Rewards within the existing laws Rewards can only be redeemed by paying for output from the asset that the Rewards back. For example, Rewards could be designated in litres of water, kWh of energy, months of occupation. Alternatively, we could designate Rewards in regular money but increase the number of Rewards not yet repaid by the previous period’s inflation rate. The two methods can be combined so that the number of Rewards is increased if the output value of the asset does not increase with inflation. The symbol x is multiply, / divide, ^ to the power of, + add, – subtract. However, with inflation investors suffer real losses if repayments are equal over the period of the loan. If a loan has an equal repayment amount each year, then the real cost in the last year of a repayment is much less than the real cost of the first year’s repayment. Investors will be attracted to inflation adjusted repayments because the total return in present day money can be made the same or better with Rewards. A 50-year loan $100 at 5% with 3% inflation gives a present day value total return of $145 while a 50-year Reward at 5% with capital and interest adjusted for inflation gives a present day value total return of $172. That is the investor is better off over the 50 years with Rewards. However, the repayments in unadjusted figures are 5.48% for loans and 3.45% for Rewards. This means the borrower who uses Rewards can borrow about 60% more for the same initial repayments. A 20-year loan $100 at 8% with 3% inflation gives a present day value total return of $156 while a 20-year Reward at 5% with inflation gives a present day value total return of $152. That is the investor gets the same present value return with Rewards or Loan. However, the Rewards borrower can borrow about 35% more for the same initial repayments because the initial repayments are 10.19% for loans and 7.62% for Rewards. Removing the time value on money tokens will change investor behaviour. Investors become patient investors and will look for long-term investments that give an inflation adjusted return. This will change behaviour because current loans repayments favour a rapid return of Capital and short-term investments. Borrowers who have long-term assets whose value increases with inflation either through increased prices or decreased costs will look to finance their assets with Rewards because they can borrow more for the same value periodic repayments. Public Infrastructure funded through Loans and repaid with taxes or monopoly user charges will replace their loan commitments with Rewards. Banks will start to change their loans to Money Rewards where interest is not paid on interest to better match the investments they make in productive assets. It is expected that the approach will rapidly move through the financial system and the effect will be to remove the cost of inflation and to reduce the cost of long-term capital. In effect, the productivity of Capital is increased. If enough funds are invested with Rewards, it is highly likely that general inflation will be eliminated. I support your proposal that money should not earn interest by proposing in a number of my articles that money should have a usage cost or what some describe as a “demurrage” charge or “negative interest”. In this way neither savings would earn interest nor would new money need to be created to pay interest creating a perpetual driver for non sustainable economic growth and/or depreciation of the currency. Refer to my paper: ‘Options for reforming the financial system’ presented to the 40th Australian Conference of Economists, Australian National University, Canberra, July 11-13 available at: http://ssrn.com/abstract=1322210. One of the options that I favour is set out in my paper: ‘Might sustainable energy money have a future?’ Presented as a refereed paper to the 11th conference of the Society of Heterodox Economics, University of New South Wales, December 3, 2012, Chapter 13, pp. 178- 189, available at: http://ssrn.com/abstract=2178533. Reasons why the existing system is back to front, inside out and upside down are set out at ‘Can Democratic Money with Environmental Values Reduce Market Failures? Posted February 26, by Long Finance, part of the “Z/Yen CommunityZ” at: http://www.longfinance.net/long-finance-blogs/the-pamphleteers/722-can-democratic-money-with-environmental-values-reduce-market-failures.html. I worked out something along this line years ago. 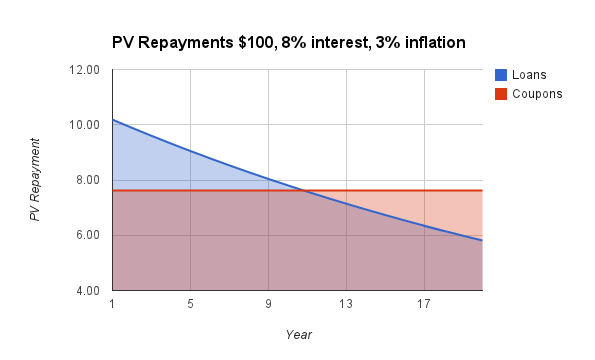 The idea was to have loan repayment be a function of two variables, not just one (the interest rate). One represented the inflation rate — and it applied to the principal as well. The other represented the future value of money, the opportunity cost of loaning it. The benefit for a mortgage, e.g., is that the loan will still work for both parties through any change in inflation, no matter how large or unexpected — provided that the inflation is similar throughout the economy, at least as far as those parties are concerned. And you could renegotiate already-existing mortgages any time, to the benefit of both parties in many cases. Especially since the existing ways of adjusting for inflation (ARMs, interest-rate caps) fail to correct the basic problem, which is that unexpected inflation forces accelerated repayment of principal, when not intended or wanted by either party. Later I learned that there already was such a thing, called a PLAM (price level adjusted mortgage). My idea was mainly a different way to explain it. But the PLAM didn’t catch on widely, since inflation has been low for decades, so the PLAM hasn’t been necessary yet. PS: Currently I’m doing another money-accounting project at http://www.RepliCounts.org. Here the idea is to create a smarter ecommerce infrastructure, by letting online accounts reproduce (replicate) — creating independent “children” accounts, grandchildren, and family trees, which inherit most settings of the parent.